Need to seal and protect against corrosion? Corrosion at the flange gasket interface is a well-documented phenomenon in upstream hydrocarbon recovery and processing. 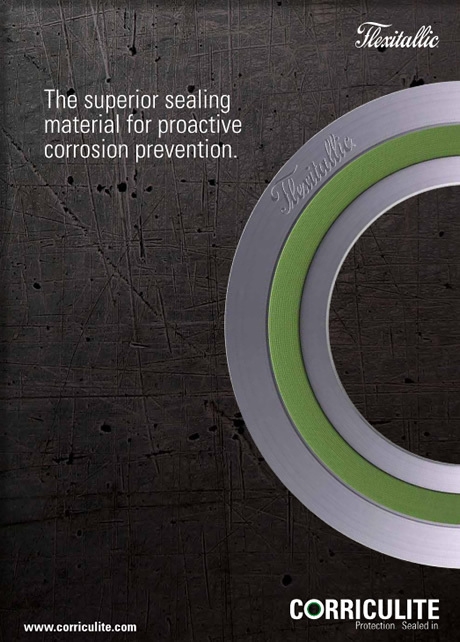 Flexitallic Corriculite is a specially formulated spiral wound gasket filler material designed to address the issues associated with the use of graphite and mica filled spiral wound gaskets. Graphite is an effective electrical conductor and as such has the ability, via galvanic action to actively promote corrosion. The use of mica while offering resistance to corrosion raises concerns about joint tightness. The spiral wound gasket is a proven design, providing reliable sealing performance and high levels of gasket resilience. When used in combination with Corriculite filler it can offer a high integrity, cost effective solution to the problem of galvanic induced flange face corrosion. Corriculite filled gaskets are available to suit both standard pipeline and specially designed vessel flanges. Gasket configuration and metal section are based on application details. Contact our technical team for further information. Increase water pipeline integrity to reduce leakage.